Apple has activated a portal on its iTunes Store that allows users to give monetary donations directly to the American Red Cross, with the gifts going to relief efforts as those on the Eastern Seaboard cope with the aftermath of Superstorm Sandy. All told, the hurricane caused 33 U.S. fatalities, billions of dollars in damage and the electrical outages affecting some some 8 million people, 6.9 million of whom are still without power, reports CNN. To alleviate some of the burden from government agencies, Apple and the Red Cross have partnered to offer an easy and anonymous system of donation giving through the iTunes Store. Because the service is linked with existing credit cards on file through Apple's servers, users can quickly give $5 to $200 simply by signing in to their iTunes account and clicking the "Donate" button. 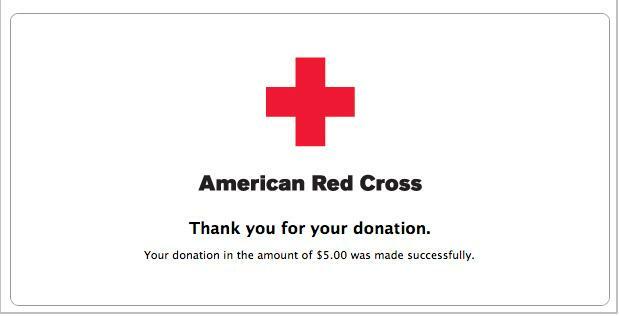 According to the terms, iTunes will transfer 100 percent of all donations directly to the American Red Cross without sending users' names or contact information. Apple will not allow iTunes Store credit to be used when making donations. The iTunes and Red Cross giving system was most recently activated following the devastating earthquake and resulting tsunami that hit Japan in March 2011. Before that, Apple offered the service in 2010, following a series of deadly earthquakes in Haiti.